First Line: A cold gust of wind whipped across the Ethete powwow grounds and flapped at Father John Aloysius O'Malley's windbreaker. It's time for the big Ethete powwow on the Wind River Reservation in Wyoming, but when the Arapaho tribal chairman is found murdered in his tepee there on the grounds, the entire tribe is in shock. Father John O'Malley, pastor of the St. Francis Mission on the reservation and friend of the dead man is also in shock. All the evidence points to the chairman's nephew, but Father John and Arapaho lawyer Vicky Holden believe the evidence is pointing at the wrong person. The trail these two follow leads all over the reservation, into fraudulent oil and land deals and-- eventually-- all the way back into the past. What they begin to piece together puts them right in the cross hairs of a determined killer. If you're like me and enjoy mysteries that are permeated with Native American culture and history, put Margaret Coel's Wind River mysteries on your reading list. This first book in the series is a strong blend of well-plotted mystery, a setting that should be listed in the cast of characters, Arapaho culture and history, and two strong, interesting leads in Father John O'Malley and Arapaho lawyer Vicky Holden. "In the distance, the brown humps of the Wind River Mountains rode against the sky like a herd of giant buffalo." The high plains setting of the Wind River Reservation plays an important role in the book, especially if you keep in mind the fact that Father John and Vicky are a thirty to forty-five minute drive from anywhere. It's remote, it's beautiful, and its weather can turn on a dime. Father John O'Malley taught history in Jesuit prep schools back East until his drinking spiraled out of control and he was sent in disgrace from Boston to the Wind River Reservation. To his surprise, he fell in love with the landscape and with the Arapaho people. Vicky Holden was the wife of a drunk and abusive man. She divorced him and took the long lonely road to law school. Vicky is much more prickly than Father John, but both are strong, intelligent, and just the kind of characters to sustain a long series. I was swept up by the story very quickly, and I appreciated how Coel skillfully wove present-day Arapaho issues into the narrative. Although I did identify one of the villains of the piece very early on, the killer came as a total surprise. The reveal should not have been so amazing, however, because there were clues all along the trail-- proof of how the story made me put aside my deductive skills. If there was anything I didn't like about the book, it was the fact that the story was over much too soon and left me with a craving for more-- in particular, more of Vicky Holden. Father John received the lion's share of the attention in this book, and Vicky is such a fascinating character that I'm dying to learn more about her. 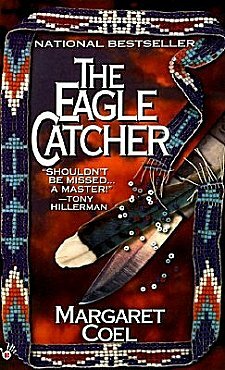 Good mystery, evocative setting, Native American culture and history, and two characters with whom I need to become better acquainted. I'm definitely returning to Wind River! Love the cover of the book, and I'm looking forward to reading this series myself. I hope you enjoy it, too, Barbara!